The Rat-Kind are plotting to wipe out the Mouse Kingdom of Carminel in this thrilling story from acclaimed author Roger Mortimer. Only Rufus, a slave, can stop them. First, though, he must find the ancient treasures of the Lord of Light and enlist the help of the legendary eagles of Carminel. Pursued every step of the way by ruthless rat warriors, Rufus is tested to the limit. Is he brave, strong … and fast enough to find the treasures before the rats get them... or will the rats get Rufus first? 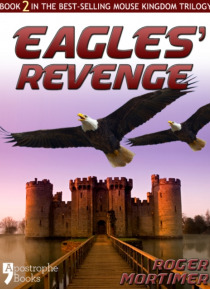 Eagles' Revenge is the second book in the best-selling Mouse Kingdom trilogy that also includes Eagle Warrior and The Ruby of Carminel.